The short version is that it was proposed in 1963, then sacrificed on the altar of the Tyne and Wear Metro, when the new Tyne and Wear County Council agreed during their "Interim Review of Road Proposals" on 31 July 1975 (prepared April 1975) that the East-West Motorway should be placed in "Category 3 - schemes not to be proceeded with". In short, that really isn't all that surprising - indeed the most surprising thing is that the motorway was ever proposed at all! Well, pretty much the entire motorway was to have been underground. Yes, absolutely. Not only that, but it would have been literally right underneath the city centre - traversing it from one side to the other. That's right, underneath the main shopping areas! Absolutely. Not only did they come up with full reports regarding the route and the costings, but also they considered very carefully the ventilation required - indeed there is in existence within the Tyne & Wear Archives a fairly hefty report just dealing with that! It talks all about the required ventilation shafts and automated fan system. As you can imagine, it's a thoroughly riveting read. That doesn't sound all that expensive. Perhaps not - but bear in mind this was for a very, very short motorway - about 1 mile long. It was billed at the time at "£1000 per foot", and would have been one of Britain's most expensive roads. In order to save costs, the underground section would not have been tunnelled, but would have been "cut and cover" - in other words, a huge hole dug and then a roof stuck on the top. Can anyone spot the slight flaw in the plan? Err, yes, I think so. If you're digging a big hole, then you'd have to demolish anything in the way. Absolutely. Now, remember that the thing was to go right under the city centre, and you can see that there would have been a huge cost, both financial and in architectural terms. Yes, I'm shaking my head in amazement as well. The route would have started at New Bridge Street, at the junction with the Central Motorway East. Hopefully you can now see why that junction is a bit of an odd shape and in an oversized space! Perhaps surprisingly, this first section would see a double-deck section, with dual carriageways on top of one another - the top one being at ground level. It would have then headed up Durant Road - which was built on land that was once reserved for the East-West Motorway - with the rest being the car park to the north. It would have then headed underground just before Ellison Place, then passing underneath Northumberland Street and Northumberland Road, before emerging on the west side of Percy Street before meeting the Central Motorway West in the general area of Leazes Lane. 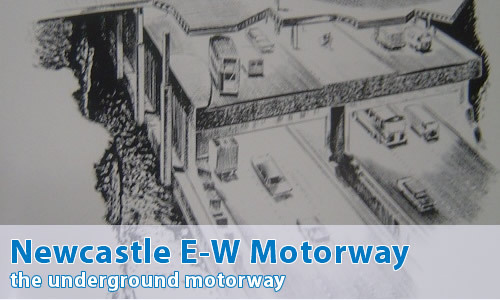 As the East-West Motorway was planned to be built prior to the CMW, there would have been a link to Gallowgate built early. I'm not that familiar with Newcastle-upon-Tyne. Can you just show it to me? Yes, although if you know Newcastle at all, you'll be just as amazed as me that it was ever seriously considered! Oh right. Now, there's a bus station under Eldon Square that definately looks like it was meant to be part of this motorway! Yes, I've heard this one from one or two people. Whilst I can't be 100% certain, the maps I have all show the Underground Motorway to be somewhat to the north of Eldon Square, so I doubt it. Truly a vandal's charter, demolishing everything in its path. Now if it had been Gateshead town centre razed by cut and cover roads, I don't think anyone would mourn the buildings lost, as anything erected as a replacement would be an improvement. But in Newcastle it would have been criminal. There's a thought - was T. Dan Smith involved? T. Dan Smith was definitely involved. It was one of his grand, and by grand I mean grander than anything your could possibly imagine grand, ideas for modernising Newcastle. He has everything planned from motorways, to tower blocks and trailblazing 60s architecture. I don't doubt that he genuinely felt that his plans would be good for Newcastle, his heart was in the right place. It's just that in hindsight, most of his plans weren't as good as he imagined. Not to mention the fact that he was taking backhanders from the architect (John Poulson) who was giving him quite a few of these wild ideas. As for Eldon Square Bus Station, I've been told by quite a few people that it was related to the East West motorway in some way, but wasn't actually part of it. Some people have mentioned that it may have been a feeder of some kind. And that comes from civil engineering lecturer types at the local unis, so I suspect there may be some truth. I always thought it looked like a really odd sort of bus station myself.